step calculates the step response of a dynamic system. For the state-space case, zero initial state is assumed. When it is invoked with no output arguments, this function plots the step response on the screen. step(sys) plots the step response of an arbitrary dynamic system model, sys. This model can be continuous- or discrete-time, and SISO or MIMO. The step response of multi-input systems is the collection of step responses for each input channel. The duration of simulation is determined automatically, based on the system poles and zeros. 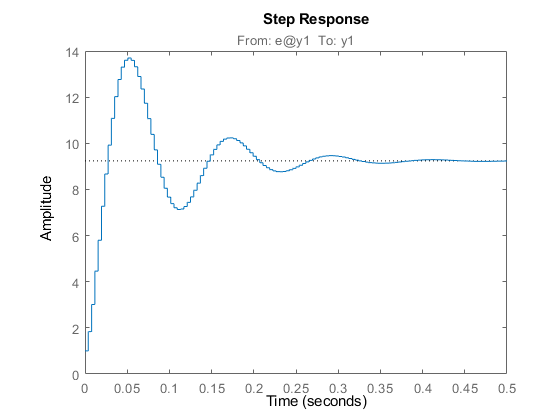 step(sys,Tfinal) simulates the step response from t = 0 to the final time t = Tfinal. Express Tfinal in the system time units, specified in the TimeUnit property of sys. For discrete-time systems with unspecified sample time (Ts = -1), step interprets Tfinal as the number of sampling periods to simulate. step(sys,t) uses the user-supplied time vector t for simulation. Express t in the system time units, specified in the TimeUnit property of sys. For discrete-time models, t should be of the form Ti:Ts:Tf, where Ts is the sample time. For continuous-time models, t should be of the form Ti:dt:Tf, where dt becomes the sample time of a discrete approximation to the continuous system (see Algorithms). The step command always applies the step input at t=0, regardless of Ti. All of the systems plotted on a single plot must have the same number of inputs and outputs. You can, however, plot a mix of continuous- and discrete-time systems on a single plot. This syntax is useful to compare the step responses of multiple systems. 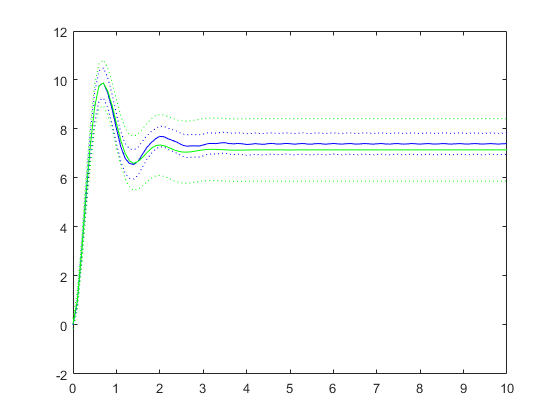 plots the step response of sys1 with a dotted yellow line and the step response of sys2 with a green dashed line. For identified models (see idlti and idnlmodlel) [y,t,x,ysd] = step(sys) also computes the standard deviation ysd of the response y (ysd is empty if sys does not contain parameter covariance information). [y,...] = step(sys,...,options) specifies additional options for computing the step response, such as the step amplitude or input offset. Use stepDataOptions to create the option set options. The left plot shows the step response of the first input channel, and the right plot shows the step response of the second input channel. 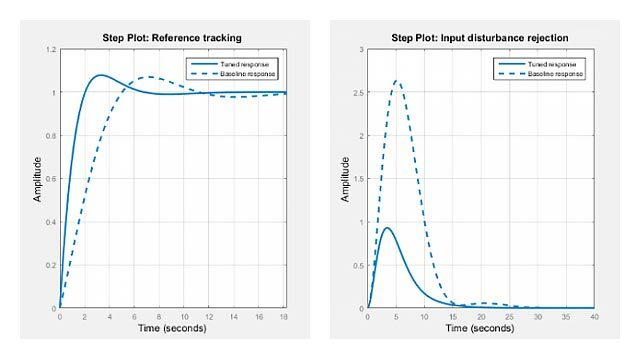 Create a feedback loop with delay and plot its step response. The system step response displayed is chaotic. The step response of systems with internal delays may exhibit odd behavior, such as recurring jumps. Such behavior is a feature of the system and not software anomalies. 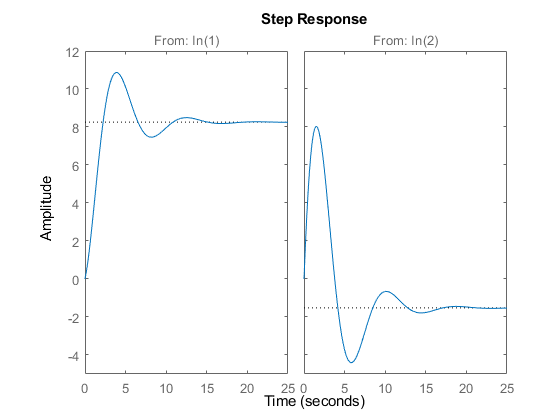 Compare the step response of a parametric identified model to a non-parametric (empirical) model. Also view their 3 σ confidence regions. Plot the step responses for comparison. Validate the linearization of a nonlinear ARX model by comparing the small amplitude step responses of the linear and nonlinear models. Estimate a nonlinear ARX model. Determine an equilibrium operating point for nlsys corresponding to a steady-state input value of 1. 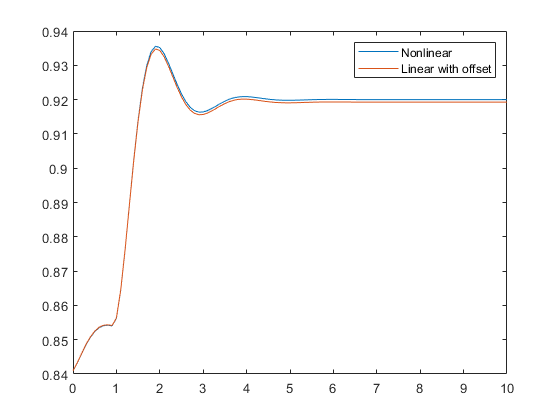 Obtain a linear approximation of nlsys at this operating point. Validate the usefulness of sys by comparing its small-amplitude step response to that of nlsys. The nonlinear system nlsys is operating at an equilibrium level dictated by (u0, y0). Introduce a step perturbation of size 0.1 about this steady-state and compute the corresponding response. The linear system sys expresses the relationship between the perturbations in input to the corresponding perturbation in output. It is unaware of the nonlinear system's equilibrium values. Plot the step response of the linear system. Add the steady-state offset, y0 , to the response of the linear system and plot the responses. 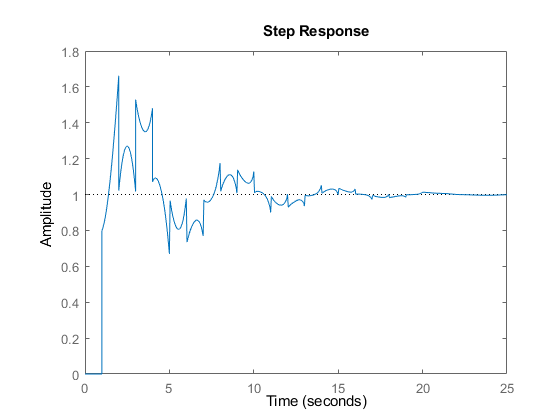 Compute the step response of an identified time-series model. A time-series model, also called a signal model, is one without measured input signals. The step plot of this model uses its (unmeasured) noise channel as the input channel to which the step signal is applied. ys is a model of the form A y(t) = e(t) , where e(t) represents the noise channel. For computation of step response, e(t) is treated as an input channel, and is named e@y1. Continuous-time models without internal delays are converted to state space and discretized using zero-order hold on the inputs. The sample time is chosen automatically based on the system dynamics, except when a time vector t = 0:dt:Tf is supplied (dt is then used as sampling period). The resulting simulation time steps t are equisampled with spacing dt. For systems with internal delays, Control System Toolbox™ software uses variable step solvers. As a result, the time steps t are not equisampled. L.F. Shampine and P. Gahinet, "Delay-differential-algebraic equations in control theory," Applied Numerical Mathematics, Vol. 56, Issues 3–4, pp. 574–588.